Some Question and Answers can get lengthy and you only know when you're going to spend too much time once you're half way. 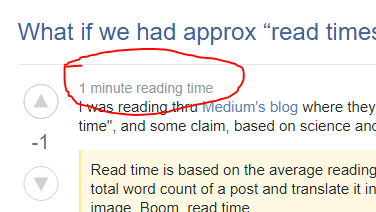 This userscript will add the approximate reading time at the top of each post. The script is tested with TamperMonkey on Chrome/Win10. If you desperately want this on GreaseMonkey 4 on Firefox, I need to be bribed. You can find the source on GitHub here where I also take bug reports. Browse other questions tagged script posts .